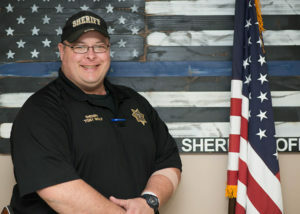 JUNCTION CITY — Geary County Sheriff Tony Wolf entered a plea of not guilty to a felony theft charge as well as a misdemeanor during an arraignment hearing Friday morning. According to the Dickinson County Attorney’s office, who is prosecuting Wolf in this matter, a jury trial date has been set for May 8-9 in Geary County District Court. A pretrial hearing is scheduled for March 29. Sheriff Wolf was arrested by the Kansas Bureau of Investigation in October for a misuse of public funds, a misdemeanor, and felony theft for gifting a department-owned firearm to a third party. The Junction City Daily Union reported last month that Wolf’s ex-wife Jodi, a Kansas Highway Patrol trooper testified she was gifted a Glock 43 to have while she’s off-duty. The defense argues it was a service weapon passed on from one officer to another for use in the field. The department reportedly has no specific policy on loaning officers a back-up weapon. Wolf was placed on administrative leave following his arrest. The post Geary County Sheriff pleads not guilty to charges, trial date set appeared first on News Radio KMAN.